Happy Recipe ReDux day friends! Hey – who says Valentine’s is just one day? It’s still February, which means we can continue with the chocolate love, and oh boy are we ever! 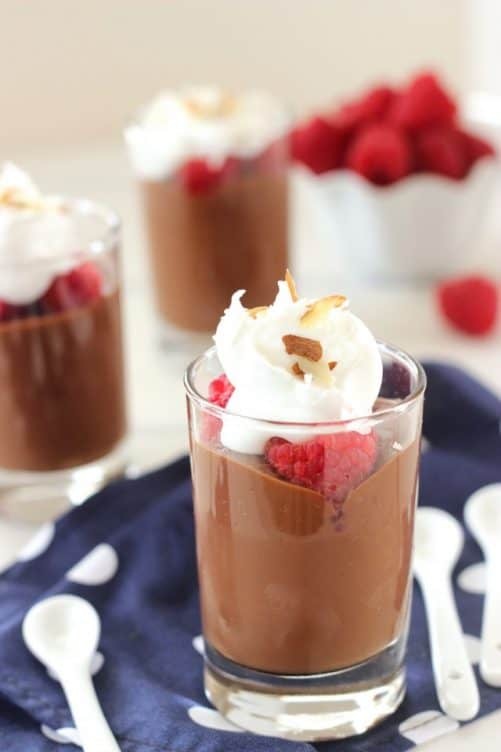 This month, members of the Recipe ReDux were challenged to find a friend (or two) for chocolate and to share our healthier chocolate combo recipes. The funny thing is — chocolate does not need my help to find a friend. It’s gotta be the most popular kid on the block, because I personally couldn’t think of anything that doesn’t go perfectly with chocolate. Let’s see… milk, peanut butter, bananas, strawberries, raspberries, coffee, nuts, coconut, peppermint… you get the picture. I love chocolate any and all ways, and I’ve shared a few favorites before. My Flourless Chocolate Cake has a bit of coffee in it. My Black Forest Molten Chocolate Cake of course features cherries, my Vegan German Chocolate Energy Bars are full of coconut and pecans, my Chocolate Banana Peanut Butter Energy Bites – well, that one’s obvious, and of course, there’s my Dark Chocolate Dipped Spiced Orange Slices. Yep. I do love chocolate with pretty much anything. The nice thing about chocolate, especially dark chocolate, is that a little really does go a long way. It’s so rich that just a bite or two satisfies the craving, and it does so with lots of antioxidants. Can’t go wrong there. 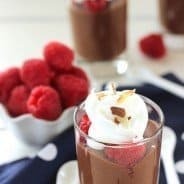 For this Recipe ReDux challenge, I decided to go vegan, and experiment with chocolate pudding. I used to think “real” pudding was the kind that came in a box but you had to cook it, rather than just whisk it together with cold milk. Until I caught on and read the ingredients label. I haven’t had pudding in 100 years, but now that I know how incredibly easy and guilt-free it is, I think I’ll be making it juuuust a little bit more often. I love that these are tiny servings too. Unless you want to make it for next Valentine’s Day and just split the entire thing 2 ways for dinner… I’ll let you make that call. If making non-dairy whipped coconut cream, chill a mixing bowl and beaters in the refrigerator for at least an hour. In a medium saucepan, mix together sugar, cocoa, cornstarch and salt. Add coconut milk beverage and 1/2 teaspoon coconut extract, and whisk well to combine. Cook over medium high heat, until mixture comes to a boil and thickens. Remove from heat, and stir in 3 tablespoons of shredded coconut, reserving remainder for a garnish. 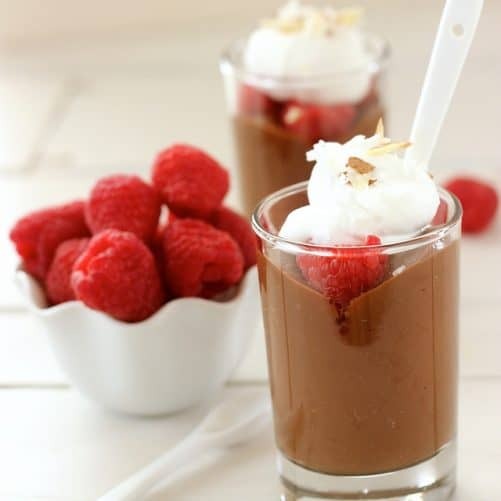 Pour pudding into individual serving dishes and let cool to room temperature, or cover with plastic wrap and chill in the refrigerator for later. For non-dairy whipped cream, open the bottom of the cold can of coconut cream and pour out any liquid that has collected at the bottom. Place half the contents of the can in the cold mixing bowl and add sugar or maple syrup and coconut extract. Reserve the reminder or the coconut cream in a covered container for later use. Whip on med-high to high speed with a hand or stand mixer until cream is light and fluffy and soft peaks form. Add about 2 tablespoons coconut cream to each pudding serving. If desired, top each with raspberries, shredded coconut and chopped almonds. What do you like to pair chocolate with? 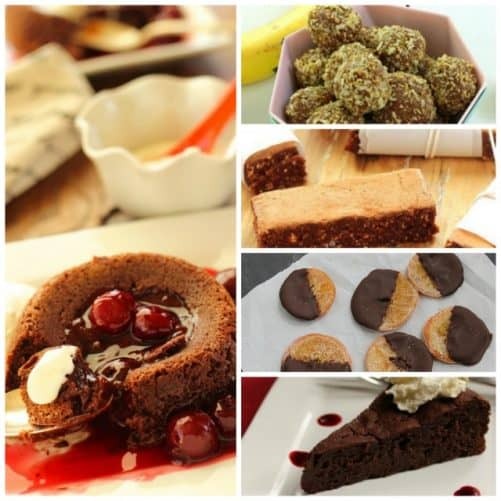 Make sure you check out the other chocolate pairings from the Recipe ReDux members! Hi there, I was hoping to add vegan Bailey’s to this do you know how I should do that and keep them the same consistancy? Hi Sierra! I think vegan Bailey’s would be delicious! My only concern is that to get the cornstarch to thicken, it has to come to a boil, and you’d boil off the alcohol. It that’s not a concern, just do a straight substitution. If you want to keep the alcohol, maybe use just a small amount of nut milk along with the cornstarch, let it thicken, and then whisk in the Bailey’s when you remove it from the heat. Let me know how it works!